"I wanted to share a super recipe with you, it's for Amaretto Tiramisu. The amaretto gives it a different taste--very yummy. 1. Beat together cream cheese and sugar in medium-size bowl until light and creamy, 3 to 4 minutes. Beat in amaretto and vanilla. 2. Fold whipped topping into cream-cheese mixture. 3. Arrange half of ladyfingers in dish just large enough to hold them in one layer, such as a 9 x 9-inch casserole dish. Sprinkle with half the coffee. Top with half the cream-cheese mixture, spreading smooth. Sprinkle with half the cocoa. Arrange the remaining ladyfingers over cocoa. Sprinkle with remaining coffee. Top with remaining cream-cheese mixture, smoothing the top. Sprinkle with remaining cocoa. 4. Cover and refrigerate at least 4 hours, or preferably overnight. Sprinkle with confectioners' sugar and sliced almonds. I really enjoyed cooking and eating this creation and so did the rest of my family. Thanks. This is a very easy Tiramisu recipe, however, I used Mascarpone cheese instead of the neufchatel cream cheese. This made it more authentic. Also, the Mascarpone is richer and smoother than cream cheese. Save the cream cheese for a fantastic cheesecake. 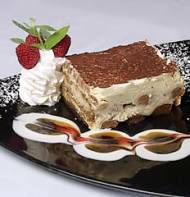 Tiramisu MUST be made with MASCARPONE. This recipe uses cool whip(whipped topping) instead of whipped egg whites which makes it easier and creamier-I liked that! !